The covered country porch across the front is a great spot for morning coffee or afternoon tea. The smaller covered porch overlooking the flat low-maintenance back yard, can serve as the main mud entrance and is a great spot to drop everything after a long day, or it can serve as the staging area for back yard barbequing. This cottage has a unique floor plan that provides flexibility and many living space options. 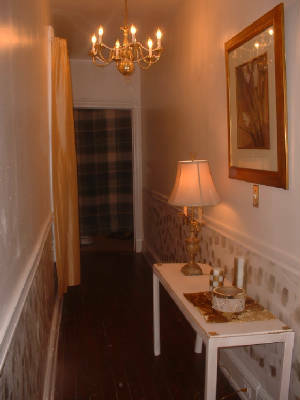 We are renovating the cottage and we are adding a little “bling” in each room for an upscale feel. There are nice hardwood floors throughout, brass chandeliers, and the house has been freshly painted with an updated kitchen and bath. 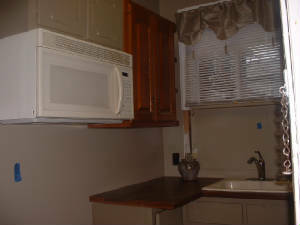 It has 2 bedrooms off the central living/dining space plus a large living room with fireplace in the front of the house. You will start your adventure as you walk along the grand entry hall with faux paint walls and nice chair rail, a brass chandelier, and faux stained glass window that lets in the natural light. The fresh faux paint and new flooring adds cottage charm to the bath. The new kitchen will be the hub of the home. A compact office space / breakfast bar combo gives the kitchen an upscale feel. The large room with fireplace at the front of the house is filled with natural light from 3 large windows. The windows will be faux stained glass to leave in the light while providing nice privacy. 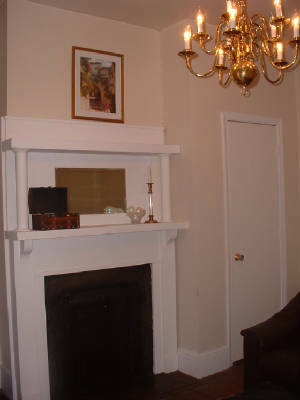 The fireplace with ornate mirrored mantel, brass chandelier, and nice dark stained hardwood floors give you a warm and upscale feeiling. We are adding cabinets to increase storage; installing a new Kohler porcelain sink and dark butcher block countertops; adding a beautiful stone backsplash, electric stove and over-the-stove microwave to reduce utility costs throughout the year; and freshly painting the entire room. The large room in the middle of the house would make a great family room or master bedroom. The small bedroom in the back can also be used for an office, or dining room. 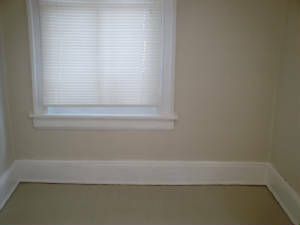 Both rooms are painted a neutral color and have upscale lighting. Upgrades Coming in 2014: Focus on improving kitchen and outdoor living space. Yards planted with flowering plants and 4-season plantings for your yr-round enjoyment. 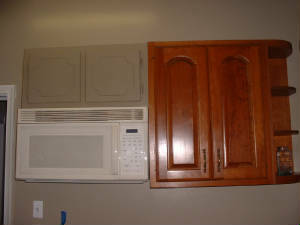 Upgrades in 2010 / 2011: Focus on interior improvements and yard renovation. Wooden underlay floor in bathroom replaced. 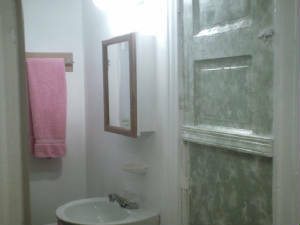 New bathroom sink, toilet, oak medicine cabinet and light installed.